Amazon.com description: Product Description: Revised and updated with a new preface and material on the rise of social media, the challenges facing printed news, and how journalism can fulfill its purpose in the digital age. Seventeen years ago, the Committee of Concerned Journalists gathered some of Americaâs most influential newspeople to ask the question, âWhat is journalism for?â Through exhaustive research, surveys, interviews, and public forums, they identified the essential elements that define journalism and its role in our society. The result is this, one of the most important books on the media ever written, and winner of the Goldsmith Book Award from Harvard, the Society of Professional Journalists award, and the Bart Richards Award from Penn State University. 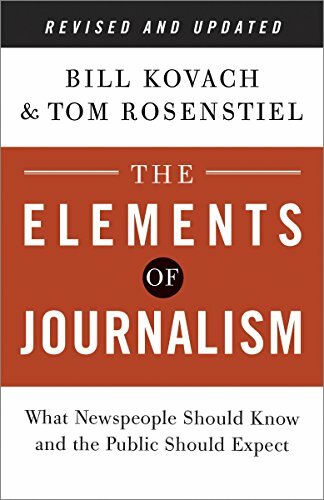 Updated with new material covering the rise of social media, sponsored content, a new, collaborative web-based journalism in which anyoneâprofessional or citizenâcan produce news, and much more, this third edition of The Elements of Journalism is an essential read for journalists, students, and anyone hoping to stay informed in the digital age. About: Outlines the main principles of journalism, discussing the ethical and professional issues affecting the work of newspeople, the forces shaping the profession, and the future of journalism. 3 rev upd edition from Three Rivers Pr (April 1, 2014); titled "The Elements of Journalism: What Newspeople Should Know and the Public Should Expect"
About: Revised and updated with a new preface and material on the rise of social media, the challenges facing printed news, and how journalism can fulfill its purpose in the digital age. Rev upd edition from Three Rivers Pr (April 24, 2007); titled "The Elements of Journalism: What Newspeople Should Know And the Public Should Expect"
About: Updated to incorporate the latest information on current media trends, online media, blogging, and other recent events, a thought-provoking study outlines the main principles of journalism, discussing the ethical and professional issues affecting the work of newspeople, the forces shaping the profession, and the future of journalism. Reprint edition from Three Rivers Pr (December 1, 2001); titled "The Elements of Journalism: What Newspeople Should Know and the Public Should Expect"
About: The authors outline the main principles of journalism, discussing the ethical and professional issues affecting the work of newspeople, the forces shaping the profession, and the future of journalism. from Crown Pub (July 24, 2001); titled "The Elements of Journalism: What Newspeople Should Know and the Public Should Expect"